First built in 1893, extended with a new nave building and tower in 1935, then bombed and burned out during World War Two. Finally, re-built in 1957. 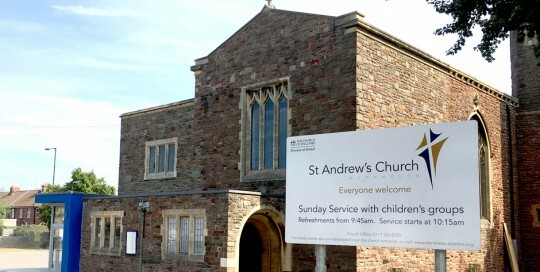 The church of St Andrew’s, at Avonmouth, near Bristol, has had a colourful history. The red stone building featured pitched roofing mostly in green-finished patina copper, dating back to 1957, but it had fallen into disrepair. 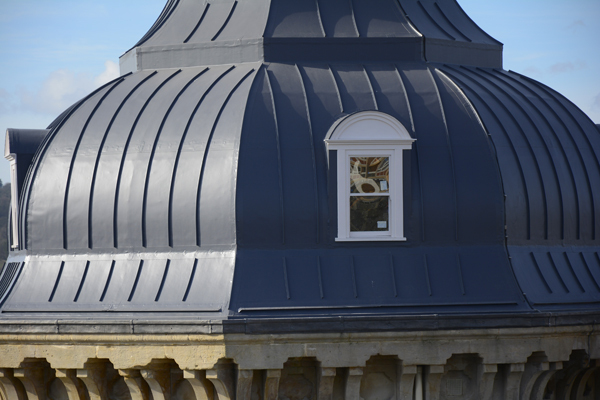 A key priority was refurbishing the roof of this prominent local landmark building. Ian Hayward, SIG Design & Technology’s Specification Manager for South West England and South Wales, said: “SIG Design & Technology was chosen for this project because we can offer multiple product expertise including for flat roofs and metals with just one phone call, as well as our depth of knowledge of roofing design. 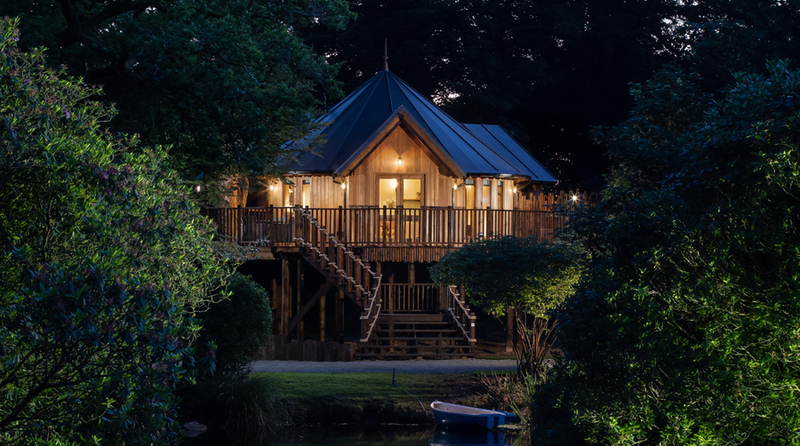 “We used an eight step process which we call #perfect roof which follows the process from product selection and roof design expertise through to full guarantees and planned maintenance. 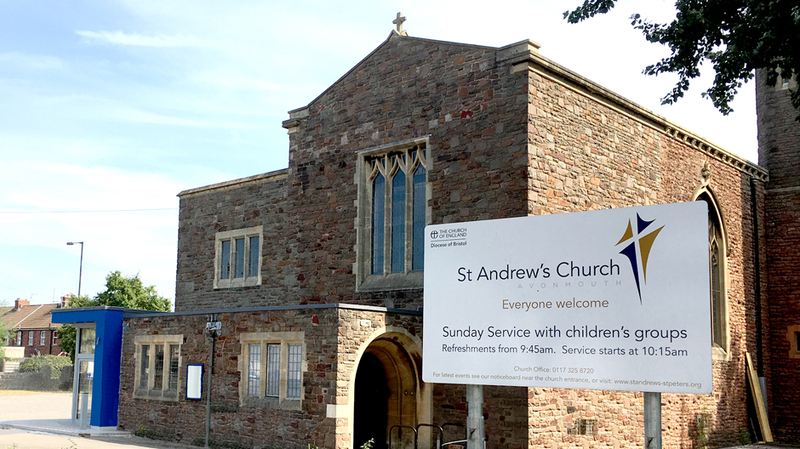 Exterior building works started in October 2017, replacing the church roofs and adding a new entrance foyer, as well as drains and toilets. 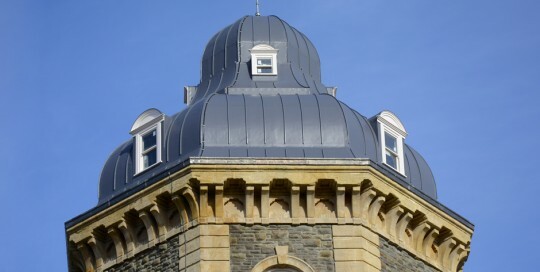 The distinctive Ogee Dome which once capped the unique 25 metre octagonal tower in the south west corner of the building was destroyed during World War Two bombing, in which other parts of the hospital were also heavily damaged. 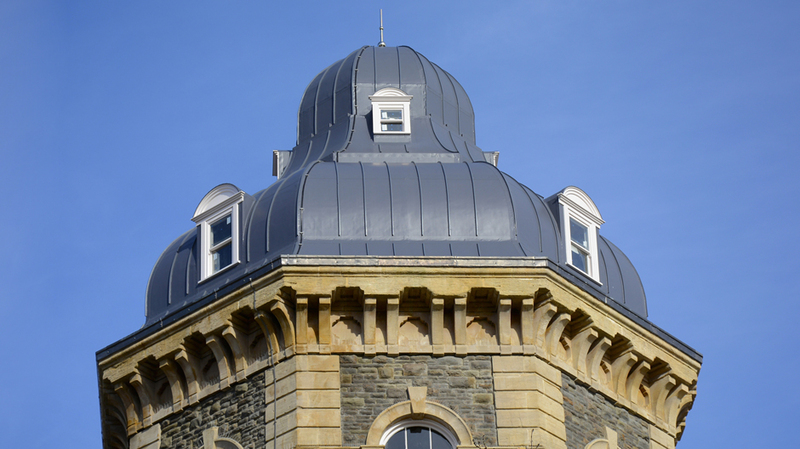 The challenge for the contractors was to painstakingly recreate the dome, with the replica forming part of plans to return the building to its original exterior design of 1853. 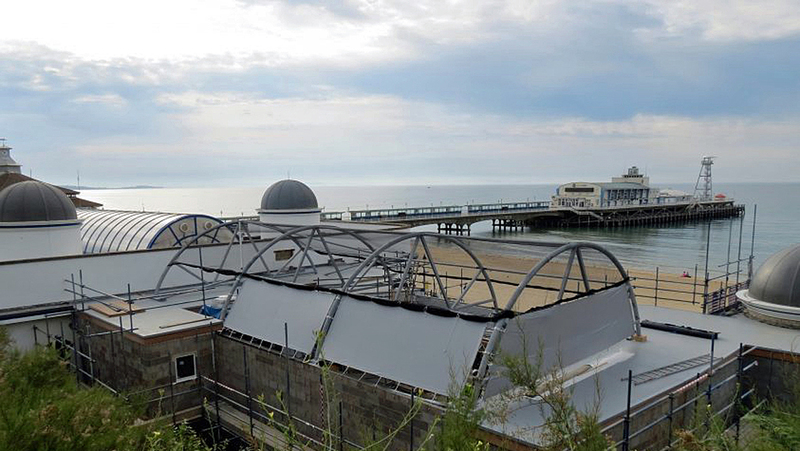 Conservation is at the heart of a £1.5million extension to Bournemouth Oceanarium. 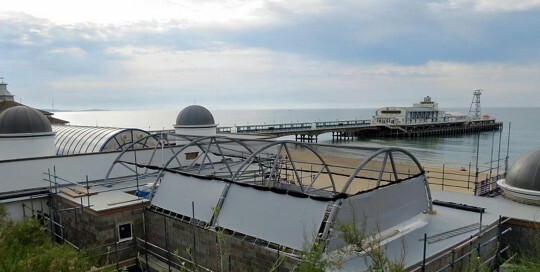 The new Penguin Beach Encounter forms the centrepiece of the extension, a two storey building housing the latest Oceanarium residents, ten Humboldt Penguins which are considered to be a very vulnerable species. Their brand new custom-built exhibit was specifically designed to replicate the birds’ natural habitat with a deep pool, beach, rockery and nesting boxes. 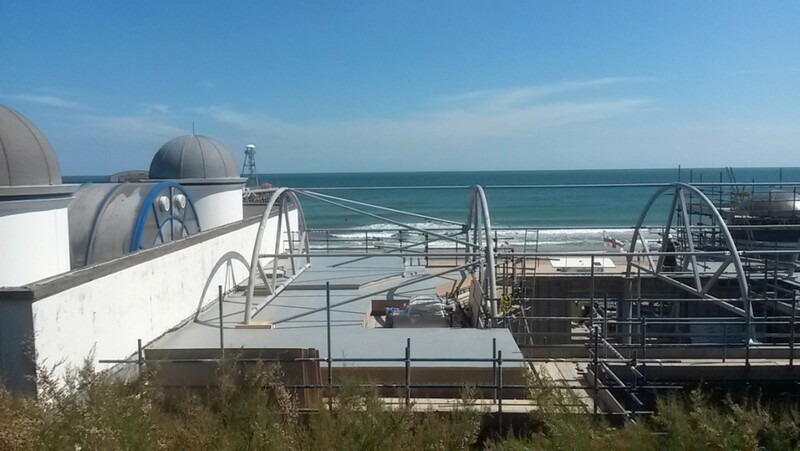 IKO Polymeric, SIG Design & Technology, and Excel Roofing Services have collaborated to design, supply and install 250m2 of single ply roofing for the new kiosk, glass covered beach walkways and stores. Five years in the planning, this custom-built exhibit is the biggest building project at the attraction since it opened in 1998 and has increased the size of the aquarium by one third. 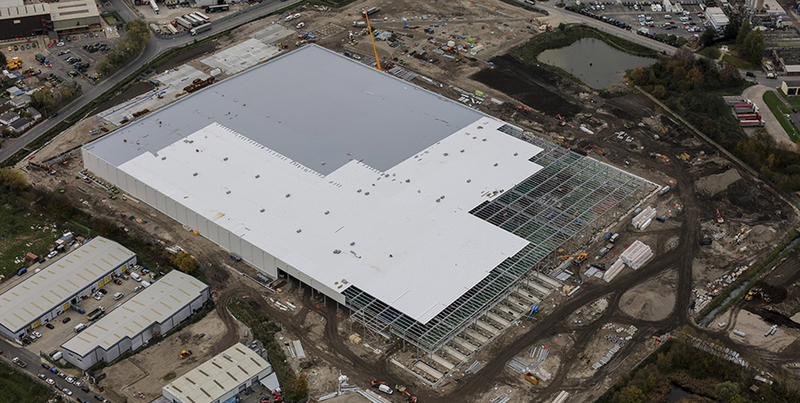 In less than four months, SIG Design & Technology, IKO Polymeric and FK Group have completed a 48,000m2 roofing project for one of the biggest online grocery centres in the world. 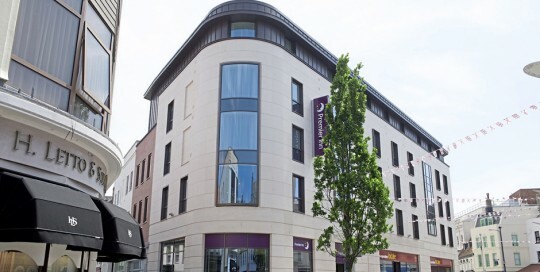 An incredibly tight programme minimised material waste and time on site, thanks to a number of innovations developed specifically for the project by the three businesses working collaboratively. The new fulfilment centre for premium British online supermarket, Ocado is based in Erith Kent, and will be operational in 2017. It will handle 200,000 orders a week and represents £185 million of investment in the locality. The project started in September 2015 and was completed in December, a very short construction programme for the large scale roofing project. 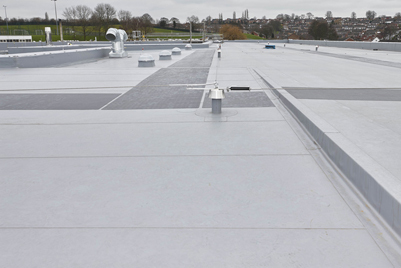 IKO Polymeric, the UK’s only single ply manufacturer, developed several innovative solutions to complete the job while minimising waste of roofing products, both in manufacture and on site. Standard length membrane is typically 20 linear metres which then has to be cut or extended (by fixing on additional sections) to fit the required dimensions. IKO Polymeric manufactured its Armourplan PVC single ply membrane in bespoke rolls of 22.35, 19.20 and 8.00 linear metres to reduce both waste and installation time for this project. As competition for schools construction projects remains high and costs are driven down, the need to meet standards of robustness, energy eﬃciency and acoustic performance become more challenging. 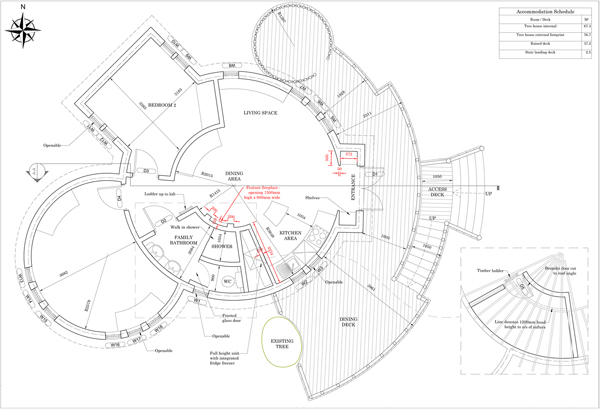 Our clients, WATES undertook a major building programme at a girls’ school in London. Part of the Priority Schools Building Programme (PSBP) and this legacy project included a new dedicated sixth form building, new sports hall and dining room. Cost eﬀectiveness was paramount and the school remained open throughout the project. 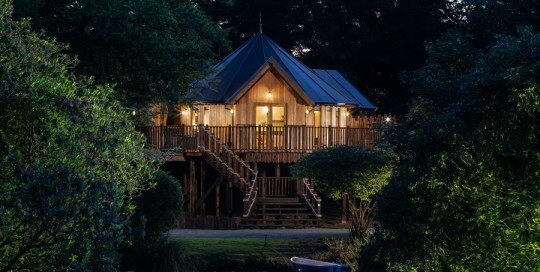 Together, the four roofs on the project, totalling over 2000m2 required two diﬀerent ﬁnishes from IKO, three diﬀerent build- ups and, crucially, one single Labour and Materials Warrantee to cover all four under our PI Insurance. The Sports Hall Roof would be built on a metal deck and was to have PV installed which requires regular maintenance. Without a ceiling, to save in cost the roof still had to comply with the latest acoustic regulations on rain noise (aka BB93) and reverberation, for both noisy sports and exams. The Dining Hall Roof would also be built on a metal deck creating acoustic issues but with no PV or roof mounted plant so without regular traﬃc. The Changing Rooms Roof was to be built on ﬂat concrete planks with roof-mounted plant, so needed to be robust to withstand regular foot traﬃc. The 6th Form Block Roof was also on ﬂat concrete planks but with only a little plant, so less need for frequent traﬃc. 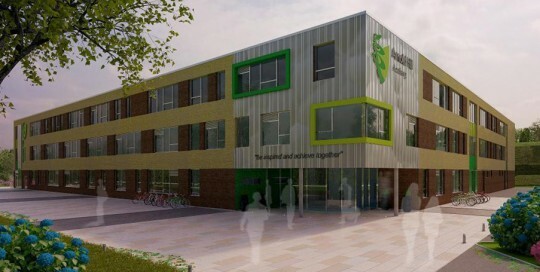 The £14m Arnold Hill Academy is part of the Priority School Building Programme (PSBP) and is being constructed adjacent to the existing school in Nottingham, which will thereafter be demolished. The new Academy’s 3,570m2 flat roof covers 8,200m2 of replacement teaching space, science labs, an indoor sports hall and a drama studio. SIG Design & Technology became involved in this project as part of their Roofing Design Services Partnership, whereby they are mandated under a bespoke framework agreement to find the most cost effective and robust flat roof solution for projects across the Wates Group. SIG Design & Technology then work closely with Wates and their consultants and subcontractors to deliver full and impartial design and specification services, monitor accredited contractors and supply a single point guarantee. 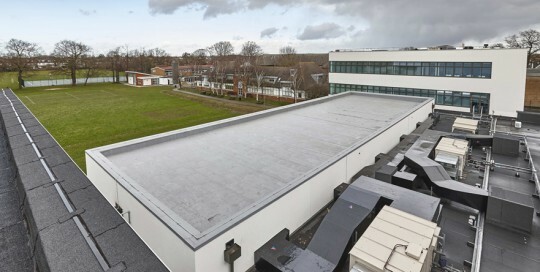 In this case the new three-storey academy building was to be constructed using Wates’ ADAPT. The short programme called for the roof package to be completed early as part of the project critical path to ensure early weather tightness and support the progress of other trades. 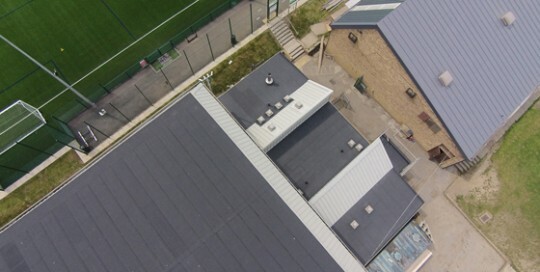 In addition, as part of PSBP requirements, the roof to the sports hall, main hall and activity studio were required to comply with the 2015 performance standards of Building Bulletin 93 (BB93) in terms of rain noise and reverberation. SIG Design & Technology has lent its support to the building of a purpose-built play room for the Scottish Children’s charity, Play Alloa. Part of SIG UK Exteriors, SIG Design & Technology has supplied roofing materials and technical support free of charge to Play Alloa’s #ourweebigbuild project. 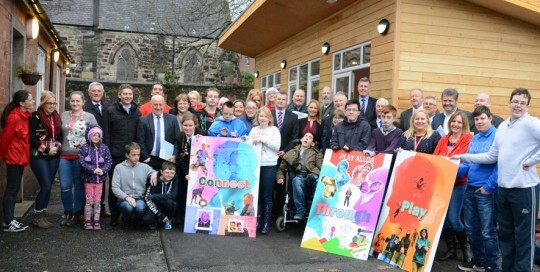 After two decades of sterling work within Clackmannanshire providing play and social opportunities together with additional support for children and adults with disabilities, Play Alloa has finally moved into its very own premises. The new building, which is in Broad Street Alloa, has a huge rear garden where three flatlets have been knocked through to create a flexible, flowing space including a large purpose built games room. Chartered architect, Lawrie Orr of Alloa developed a generic specification for the 85m2 bonded, warm roof build up in a RAL 7015 finish and said that working with SIG Design & Technology made the process very straightforward. 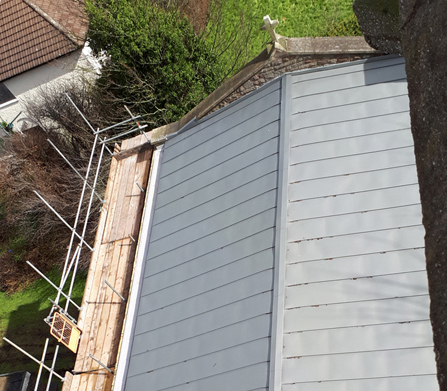 SIG Design & Technology selected IKO’s Armourplan SG PVC membrane in slate grey (RAL 7015) as the fleece backed single ply is supplied in 2m widths which minimises hot welding on site without naked flames. The roof build up also comprises Recticel tissue faced insulation (mechanically fixed) and a PE VCL layer. 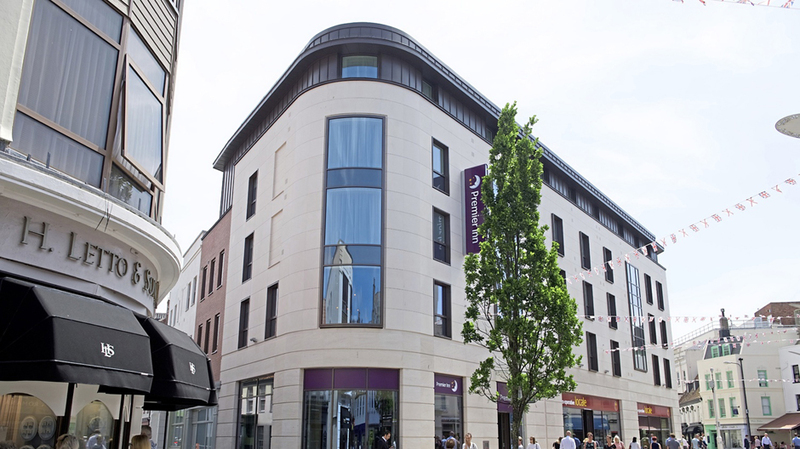 SIG Design & Technology also supplied standing seam profiles to create a water check, preventing wind-driven rain being blown off the roof and onto building users.